#AceNewsDesk – Oct.30: Those are your three options when it comes to engaging on Twitter. But apparently Twitter’s founder and CEO, Jack Dorsey (@jack), no longer likes … Likes. 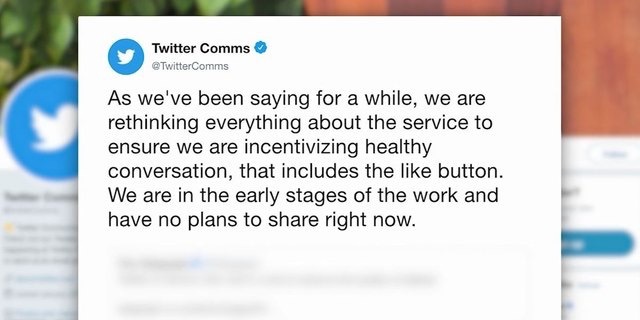 At a recent Twitter event, Dorsey told a room full of employees and journalists Twitter would be removing the heart-shaped Like button “soon”. Twitter Communications confirmed a Like button rework was being considered as part of an ongoing effort to clean up the platform — with the aim of incentivising “healthier conversations”. As we’ve been saying for a while, we are rethinking everything about the service to ensure we are incentivizing healthy conversation, that includes the like button. We are in the early stages of the work and have no plans to share right now. When a user clicks the little heart-shaped button below a tweet, a notification is sent to the poster. And according to Andrew Campbell, a researcher in the fields of e-mental health and cyberpsychology from the University of Sydney, Twitter’s biggest weakness has always been the heart. “It’s a strong emotion to say you love something,” he said. The feedback that notification gives the poster lacks context. Does the user like or love the content of the tweet? The ideology of the person? The fact that it might be funny? Or do they just like the person who posted it? “More often than not, they don’t read the message, they just love that person. So they’re perpetuating a false likelihood of the ideology of that person … and more a popularity poll.” Dr Campbell said. But will we miss our Likes when they’re gone? The Like button started life as a star-shaped ‘favourite’, or ‘fav’. However in 2015, Twitter changed the Favourite button to a Like because, “You might like a lot of things, but not everything can be your favourite“. But with global growth, come global issues, and Twitter has been under fire for failing to address targeted harassment, for harbouring racist, sexist and homophobic content, and for being host to propaganda botnets and state-sponsored influence campaigns. Some users are already lamenting the future hypothetical drama that won’t transpire without a Like button. During the 2018 Wentworth by-election, former prime minister Malcolm Turnbull “mistakenly” ‘liked’ a tweet in support of independent Kerryn Phelps, who was running against the party he once led. And Liberal Party MPs Greg Hunt and Christopher Pyne’s accounts were both caught ‘liking’ tweets containing pornographic material. In both cases the MPs claimed their accounts had been hacked. Some Twitter users are worried about losing that ability to acknowledge a tweet without sharing it. While your Twitter feed may be ablaze with hot takes about the Like button, the love heart may not truly disappear. According to Dr Campbell, it might become one of a variety of options. He believes it’s likely Twitter will move towards a “universal visual language … using emojis”, allowing for more nuanced emotional feedback. Such a change would echo similar moves by other online social and message platforms. Facebook increased the available reactions to a post from the iconic “thumbs up” to include six options in 2016, while other platforms like Slack or Twitch include a gamut of visual reactions. Another option, of course, is for them to go the other way, as rapper Briggs suggests. Twitter should remove the Tweet button. Really spice things up.